Dren Bodyguard is a common Willpower creature card. It is part of the Houses of Morrowind expansion. In addition to the card's availability in the Houses of Morrowind expansion, three copies are included in the Hlaalu Schemes theme deck, three copies in the Redoran Onslaught theme deck, and two copies in the Tribunal Glory theme deck. "I will protect you... for a price." "The Dren will reward me for this." 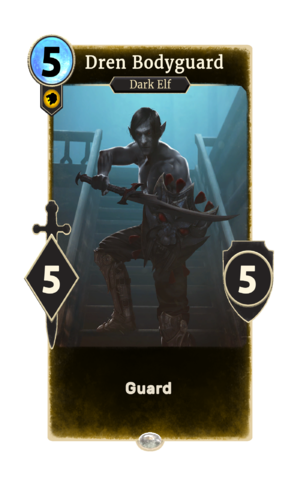 This card appears to depict Galos Farethi, who appeared in Morrowind as Orvas Dren's bodyguard. This page was last modified on 28 February 2019, at 00:06.